Over the past decade, a new media baron has emerged. Private equity funds, hedge funds and investment groups have swooped into to buy, trade and manage newspapers. With the industry in distress and publishers struggling to adapt to the digital age, many small and mid-sized communities are in danger of losing their primary source of local news and information. This raises the distinct possibility of news deserts emerging across regions of the country. This report not only analyzes the trends in ownership, but also explores the long-ranging social, economic and political impact such a shift could have. Much attention has been focused in recent years on the country’s largest and most revered national newspapers as they struggle to adapt to the digital age. This report focuses, instead, on the thousands of other papers in this country that cover the news of its small towns, city neighborhoods, booming suburbs and large metropolitan areas. The journalists on these papers often toil without recognition outside their own communities. But the stories their papers publish can have an outsized impact on the decisions made by residents in those communities, and, ultimately, on the quality of their lives. By some estimates, community newspapers provide as much as 85 percent of “the news that feeds democracy” at the state and local levels.1 This means the fates of newspapers and communities are inherently linked. If one fails, the other suffers. Therefore, it matters who owns the local newspaper because the decisions owners make affect the health and vitality of the community. For the past two years, the School of Media and Journalism at the University of North Carolina at Chapel Hill has collected, researched and analyzed data from 2004 to 2016 on more than 9,500 local newspapers. Our 2016 database includes1,700 small weeklies with a circulation of 2,000 or less, as well as 20 large metro dailies with more than 200,000 weekday circulation, such as the Chicago Tribune and Washington Post. However, because our focus is on traditional local newspapers, regardless of their size, we excluded the large national papers — The New York Times, Wall Street Journal and USA Today — from our analysis, as well as specialty publications such as business journals and shoppers. This report, divided into four sections, documents dramatic changes over the past decade. With the industry in distress, local newspapers are shrinking, and some are vanishing. At the same time, a new type of newspaper owner has emerged, very different from traditional publishers, the best of whom sought to balance business interests with civic responsibility to the community where their paper was located. As newspapers confront an uncertain future, the choices these new owners make could determine whether vast “news deserts” arise in communities and regions throughout the country. This has implications not just for the communities where these papers are located, but also, in the long-term, for all of America. The rise of this new media baron coincides with a period of immense disruption and distress for the entire newspaper industry. With profits and readership declining dramatically, every newspaper publisher is grappling with an uncertain future, and many worry about their paper’s long-term survival. As a result of these dynamics, many smaller cities and towns could lose their local newspapers and with them the reliable news and information essential to a community’s economy, governance and quality of life. The prospect of such “news deserts’’ across entire regions of the country would have significant long-term political, social and economic consequences. Within the last decade, several hundred newspapers have shut down, merged or cut back from daily to weekly publication. Most of the approximately 8,000 local newspapers that survive are small dailies and weeklies with a circulation of less than 15,000. Many are the primary, if not sole, source of local news.2 The decisions that the new, as well as long- time, owners of newspapers make in the near future will have implications both for the health of local journalism and for the vitality of their communities. This report documents and analyzes dramatic ownership trends during a pivotal decade and considers the long-term implications. Since 2004, more than a third of the country’s newspapers have changed ownership; some sold two or more times. Faced with steep declines in revenue, many long-time owners have declared bankruptcy or decided to sell while they can. Since the cost of acquiring a newspaper has fallen in tandem with shrinking profits, astute buyers with access to financing have snapped up newspapers at bargain rates in small and mid-sized markets. The new owners can then cut costs and recoup their investment in only a few short years. Whole newspaper chains have disappeared, acquired by other companies. Before the 2008–09 Great Recession, the most active acquirers were large publicly traded chains, such as Lee, McClatchy and News Corp. Since then, newly formed investment groups, including New Media/GateHouse, Digital First and Civitas, have been the most aggressive purchasers. The largest newspaper companies are larger than ever, and still growing. Big chains can achieve significant cost savings by merging production, sales and editorial functions of several newspapers, while also amassing an audience large enough to remain attractive to advertisers. At the end of 2004, the three largest companies owned 487 newspapers with a combined circulation of 9.8 million. Today, the three largest companies own about 900 papers that have a combined circulation of 12.7 million. The large investment groups tend to employ a standard formula in managing their newspapers — aggressive cost cutting paired with revenue increases and financial restructuring, including bankruptcy. Most have financed acquisitions with significant debt. To reduce costs, the new media barons have typically laid off staff, frozen wages, reduced benefits and consolidated sales and editorial functions. With revenues and profits still declining, much initial cost cutting has been painful, but necessary — and may have actually saved some newspapers in the short term. However, for the most part, profits derived from cost cutting have not been reinvested to improve their newspapers’ journalism, but used instead to pay loans, management fees and shareholder dividends. In contrast to 20th century media companies that would “buy and hold” newspapers for many years, the new newspaper-owning investment groups actively manage their properties, keeping a short-term focus on the bottom line. Because the media barons acquire newspapers primarily — or solely — as an investment, often as a relatively modest part of a diverse portfolio of nonmedia assets, they do not, or need not, pay close attention to the quality of journalism produced by their newspapers. They are constantly buying, trading and selling newspapers in their portfolio. Because they own so many newspapers, they can absorb the loss if an individual newspaper fails. If investment firms cannot sell an underperforming newspaper, they close it, leaving communities without a newspaper or any other reliable source of local news and information. Investment groups are geographically concentrated. They own between a fifth and a third of the newspapers in many states in New England, the upper Midwest, and the South. The seven largest investment groups own and operate more than 1,000 newspapers in 42 states, or close to 15 percent of all American newspapers, as defined for this study. Five of the seven largest newspaper-owning investment firms did not exist a decade ago, so it is difficult to predict whether they will continue to acquire papers or decide to sell the newspapers they currently own and move onto other more attractive investment options. Most newspapers owned and operated by investment groups are located in economically struggling small and mid-sized communities where the newspaper is the only source of local news. Without significant fresh investment, the bond between newspapers and their readers and advertisers will erode. Strong newspapers enhance the quality of life by producing journalism that documents a community’s life and identifies its issues, while providing advertising that connects consumers with local businesses. Newspapers must adapt to the digital age to remain viable community builders, or else they remain tethered to the fast-fading print-only world of yesterday. This will require a significant investment by newspaper owners and a long-term commitment to these struggling communities, not the short-term focus on earnings that has, so far, been the hallmark of the investment groups that have aggressively purchased papers in the last decade. Some communities have already become news deserts, having lost their local newspapers. Many others may soon follow. Concerns about the role and ownership of newspapers have been voiced and debated since the founding of the country. However, the dramatic shift in ownership of newspapers over the past decade — coupled with the rapidly deteriorating finances of community papers — brings added urgency to a new version of an age-old question: In the digital age, what is the civic responsibility of newspaper owners to their communities? “A newspaper is an institution developed by modern civilization to present the news of the day, to foster commerce and industry, to inform and lead public opinion, and to furnish that check upon government which no constitution has ever been able to provide,” proclaimed Robert R. McCormick, publisher of the Chicago Tribune from 1925 to 1955. For two centuries, newspapers have been an indispensable auditor of democracy at all levels in this county. 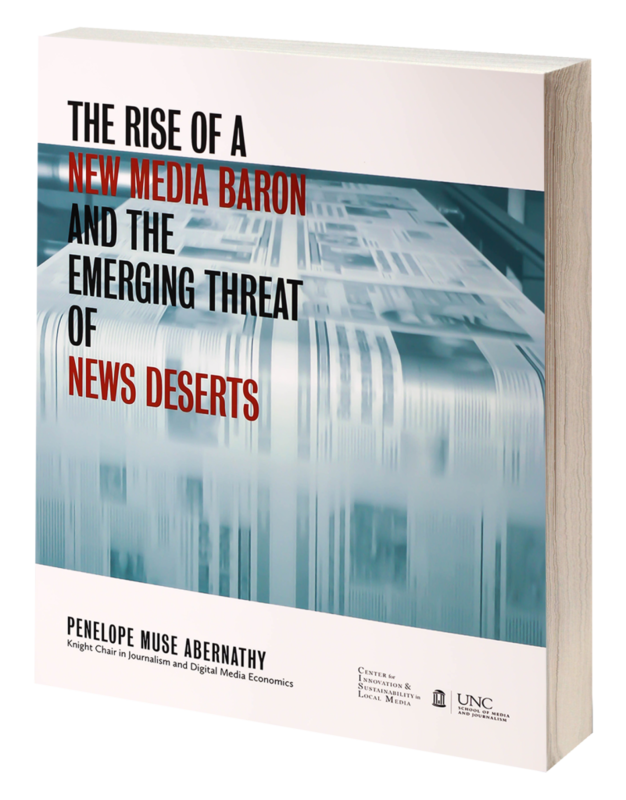 By documenting the shifting landscape of newspaper ownership and assessing the threat of news deserts, this report seeks to raise awareness that universities, for-profit and nonprofit organizations, community activists and government may have greater roles to play in addressing the challenges confronting local news media and our democracy. What can be done to save the journalism that has been provided by community newspapers for more than 200 years? There are no simple answers and no guarantees. It will take a concerted and committed effort by many to avert a growing number of news deserts. If you want to learn more, visit the website at newspaperownership.com where you can download the report and use the interactive map to see who owns your hometown newspaper. To purchase a bound copy of the report, visit Amazon.